At ProDent Care we use tooth coloured fillings (material: composite resin) as much as possible. These come in a variety of different shades enabling us to match the colour of the filling to the shade of tooth, therefore providing a much more natural look. In the past, composite resin used to be considered an inferior material, however nowadays technological advances mean it is now as reliable and it is widely used by leading dentists throughout the world. Plaque is a thin, sticky film that keeps forming on your teeth. It contains many types of bacteria. Dental decay is caused by plaque acids that gradually dissolve away the enamel and dentine of the tooth to produce a cavity. Decay happens when sugars in food and brinks react with the bacteria in plaque, forming acids. Every time you eat or drink, anything containing sugars, the bacteria reacts with it forming acids. These acids attack the teeth and start to dissolve the enamel. The attacks can last for an hour after eating or drinking, before the natural salts in your saliva cause the enamel to remineralise and harden again. It’s not just sugars that are harmful; other types of carbohydrate foods and drinks react with plaque and form acid. These are the fermentable carbohydrates such as the hidden sugars that can be added to processed food, natural sugars like those found in fruit and cooked starches. Snacking on sugary or acidic foods and drinks can increase the risk or decay, as the teeth come under constant attack and do not have to recover. It is therefore important not to keep snacking on sugary foods or sipping sugary drinks throughout the day. In the early stages of dental decay, there are no symptoms. From the examination, initial lesions are spotted from the x-ray. This is why you should visit us regularly as small cavities, which are much easier to treat than advanced decay. Once the cavity has reached the dentine, your tooth may become sensitive, particularly with sweet foods and drinks, and acidic or hot foods. As the decay gets near the pulp may suffer from toothache. If the toothache is brought on by hot or sweet foods this may last for only a few seconds. As the decay gets closer to the dental pulp the pain may last longer and you may need to take painkillers-paracetamol or ibuprofen-to control the pain. You must visit us immediately as the tooth is dying and you may develop a dental abscess if it not treated. The biting surface of the teeth and the surfaces between the teeth are most likely to decay, as food and plaque can become stuck in these areas. 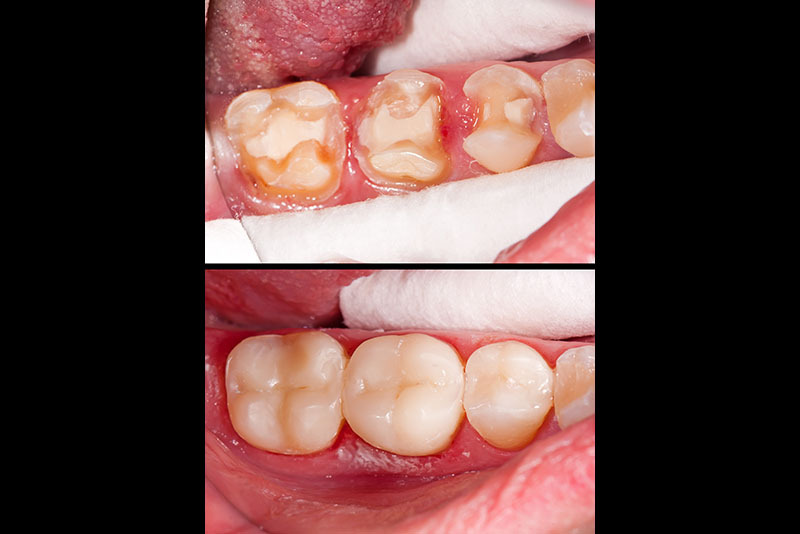 If the decay is not too serious, all decay will be removed and the tooth restored with a filling. Sometimes the nerve in the middle of the tooth can be damages. If so, a root canal treatment is needed by removing the nerve and then restoring the tooth with a filling or a crown. If the tooth is so badly decayed that it cannot be restored, the only option may be to extract the tooth. The best way to prevent dental decay is by brushing our teeth thoroughly twice a day with fluoride toothpaste, making sure that you brush the inner, outer and biting surfaces of your teeth. Using dental floss, tape or interdental aids also helps remove plaque and food from between your teeth and gum line. These are areas a toothbrush cannot reach. You should visit the dentist regularly and have sugary and acidic foods and drinks less often. Avoid snacking between meals as this limits the times your teeth are under attack from acids. Chewing sugar-free gum for ten minutes after a meal will help produce more saliva, which will neutralize the acids which have been formed.